The word “mystery” usually implies the spooky atmosphere and dark colors. That’s definitely not the case. Though the game plot is based on mysterious disappearance of an Earl and all the characters you’ll meet on your way will tell you nothing except the frightened and disjointed account, hardly there is anything enigmatic. But there are lot’s of romantics. If I were asked who’d most probably like Mystery of the Earl I’d suggest the girls who generally enjoy all the wedding rush and know what the garter looks like. 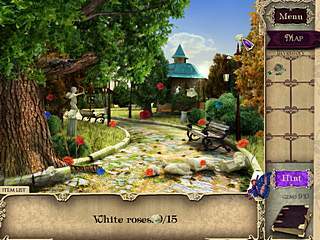 Playing as Lilian you find yourself in the garden – the place where you’re supposed to go through tutorial. Having found the blue bird and placing it to the nest you meet with approval of fairies who give you a clever pixie called April. That is your hint system. When you press your rechargeable hint button April is flying up to the item you are looking for and circles it with her magic wand. Nipping on ahead, the tasks are not at all challenging but sometimes the objects are so tiny that you’ll address April for sure just because you’ll get tired of all the sweet locations. Lilian decides to find Christian, whose confession “I have plunged into a risky venture having succumbed to the temptation of its potential fruit” might have lots of meanings and some of them could not be really pleasant to reveal. Being at Lilian’s home you get to know that Lilian is about to get married to an Erarl Christian. And the husband-to-be is not at all old and ugly and there is no financial background of the future great event. Everything goes well and the young pair is in love. But right before the church bells ring Lilian finds out that her fiancé has disappeared. She starts to search for him and finds a letter, starting with the words that can hardly anyone calm down: “If you hold this message in your hands it means that I’m already dead or will be soon”. Of course Lilian decides to find Christian, whose confession “I have plunged into a risky venture having succumbed to the temptation of its potential fruit” might have lots of meanings and some of them could not be really pleasant to reveal. And it maybe that Lilian has decided to look for Christian just to get some explanations. Who knows? Anyway if she didn’t meddle in it might mean the end of the game and we’re just at the beginning. For those of you who expect the twists in the plot or some challenging tasks Mystery of the Earl is not worth any kind of attention. 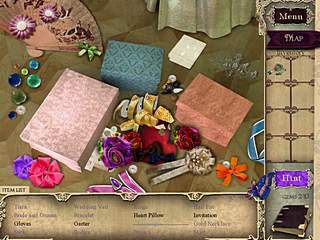 This adventure game consists of hidden object scenes and some puzzles. And it will not take much time to solve them for the experienced players. The list of the items to find either provide you with the images of the objects (and be prepared that these items will be scattered not as an entity, but you’ll have to find its pieces first) or the names of the objects (the items which names are given in grey can be found by zooming in on certain areas). In every location you’re expected to find the diamonds as an extra. These diamonds are needed to unlock a handful of screen saver's for the computer. If you wish you can also go back after you finish the game to find the rest of the diamonds, if you haven’t found them prior. Each screen saver takes one scene from the game and throws up a 3D version of it plus has one animated creature (or fairy) roaming back and forth on your monitor. The screensavers are of a slightly higher quality with more shadows and lights than the same scenes in the game. But it’s up to you whether to look for the diamonds or not in order to get such a prize. If you’re really interested in that beware that the diamonds change colors too depending on what they are hidden on. The puzzles are nothing new: to match the keys and the locks, to put together the portrait which was torn etc. Personally I liked the process of searching the keys in the box of jewelries. 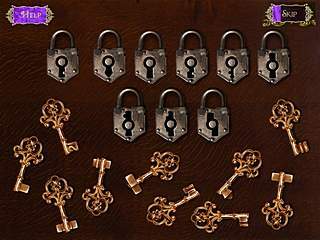 When you moved your cursor along the screen the jewelries were moving as well revealing the keys underneath, so that you needed to click on that part of the key that could be seen. The game lacks interactions though there were lot’s of characters you met with. The servant in the Earl’s estate reminded me of my grandma. The faces are drawn really nice! They are all kind and sweet in the best traditions of Disney’s cartoons. The music fits the graphics pretty well. I suppose Mystery of the Earl might seem a strange option for the Halloween eve, but for those of you who are tired of darkness, vampires, and other sinister stuff might like the game. This is Mystery of the Earl review. Download this game here.